The aims of this study were to test the effects of a mycorrhiza helper bacterium (MHB), Pseudomonas monteilii strain HR13 on the mycorrhization of (1) an Australian Acacia, A. holosericea, by several ectomycorrhizal fungi or one endomycorrhizal fungus Glomus intraradices, and (2) several Australian Acacia species by Pisolithus alba strain IR100 under glasshouse conditions. Bacterial inoculant HR13 significantly promoted ectomycorrhizal colonization for all the Acacia species, from 45.8% (A. mangium) to 70.3% (A. auriculiformis). A stimulating effect of HR13 on the ectomycorrhizal establishment was recorded with all the fungal isolates (strains of Pisolithus and Scleroderma). The same effect of bacteria on the frequency of endomycorrhizal colonization of A. holosericea seedlings by G. intraradices with vesicles and hyphae frequencies was recorded. 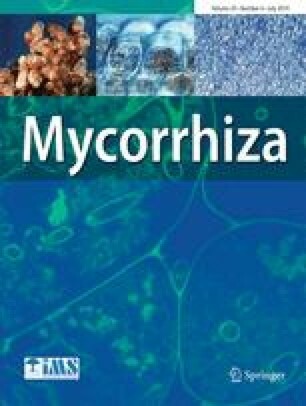 The stimulation of saprophytic fungal growth by MHB is usually the main mechanism that could explain this bacterial effect on mycorrhizal establishment. MHB could stimulate the production of phenolic compounds such as hypaphorine and increase the aggressiveness of the fungal symbiont. However, no significant effect of MHB on fungal growth was recorded with Scleroderma isolates under axenic conditions but positive bacterial effects were observed with Pisolithus strains. From a practical viewpoint, it appears that MHB could stimulate the mycorrhizal colonization of Australian Acacia species with ectomycorrhizal or endomycorrhizal fungi, and could also facilitate controlled mycorrhization in nursery practices where Acacia species are grown for forestation purposes.